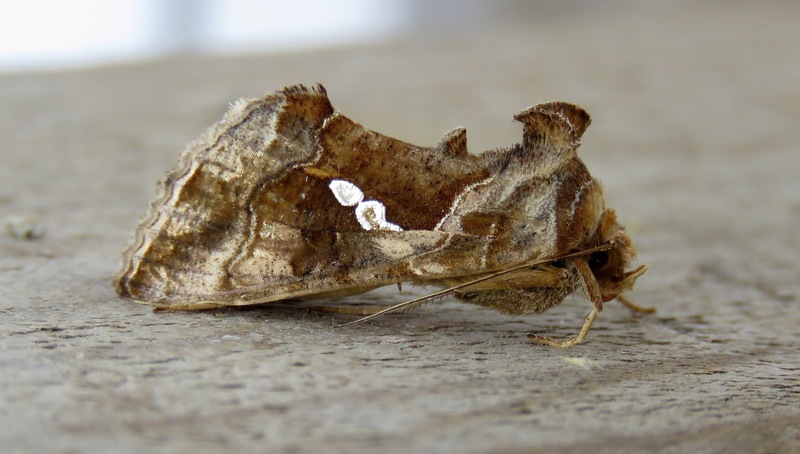 With the changes in permission for moth trapping in the area around the Long Pits, Dungeness, we are very pleased to announce that we have 2 moth licences for use by 'Friends' of the Observatory. 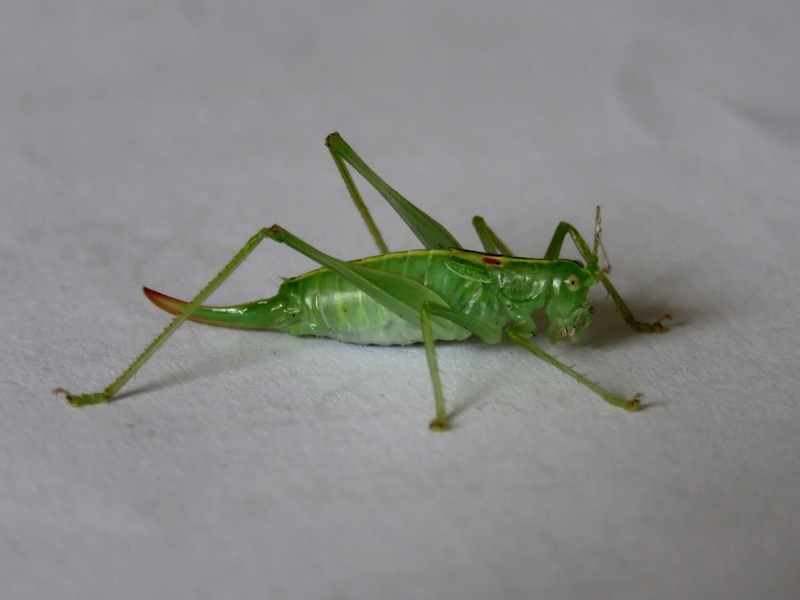 Please contact the Warden for more information. Another morning with a decent scatter of migrants in the bushes including 15 Willow Warblers, seven Lesser Whitethroats, 16 Reed Warblers, three Sedge Warblers, 14 Blackcaps, three Garden Warblers, five Spotted and one Pied Flycatcher, nine Whinchats, two Redstarts and 15 Wheatears. 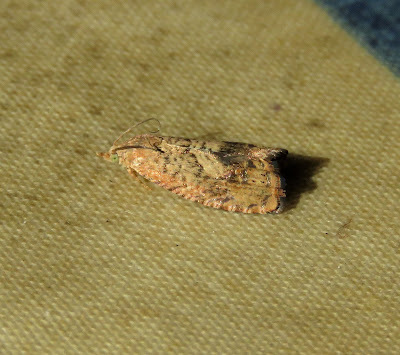 Overhead passage also saw an increase in numbers with a Buzzard, a Swift, 58 Sand Martins, 67 Swallows, 12 Tree Sparrows, 53 Yellow Wagtails and three Tree Pipits. 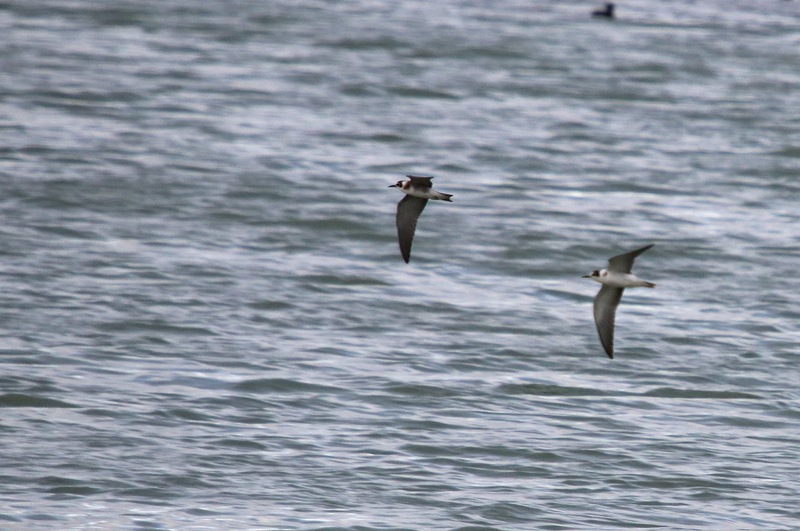 There was very little sign of any movement offshore with just four loitering Arctic Skuas of note. 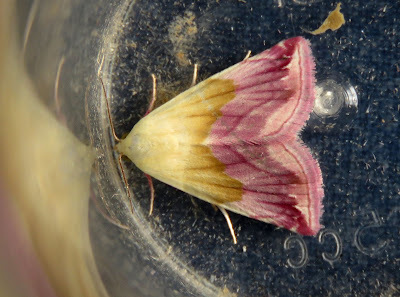 Elsewhere, the America Black Tern was seen on Burrowes Pit again and a remarkable flock of 11 Cattle Egrets arrived and joined the small herd of stock in the fields just south of Boulderwall Farm. Rain from just after dawn until mid-afternoon grounded a decent number of migrants with 11 Pied Flycatchers, five Spotted Flycatchers, seven Lesser Whitethroats, six Whinchats and two Redstarts of particular note along with a few Willow Warblers, Whitethroats and Reed Warblers. Overhead passage remains at a very low level though with just two Buzzards and a few Yellow Wagtails being seen. A Merlin was hunting around the fishing boats for much of the afternoon. 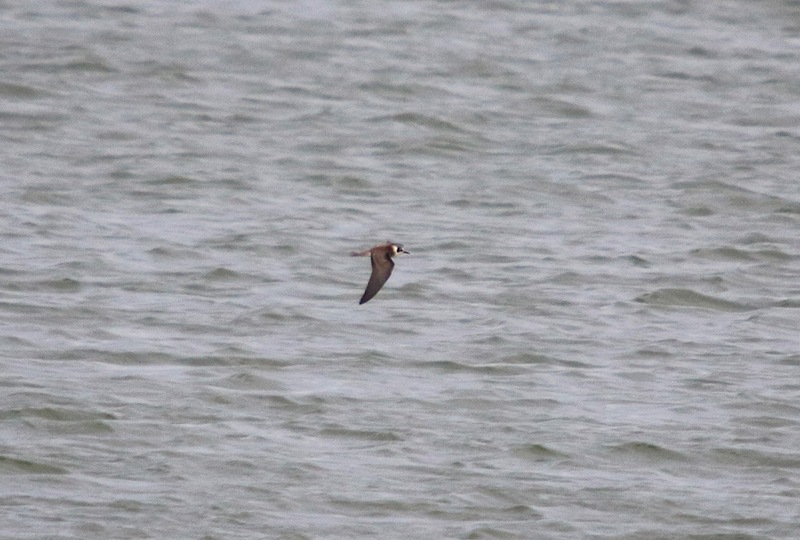 The sea was generally very quiet with the usual four or so lingering Arctic Skuas being joined by a Great Skua. 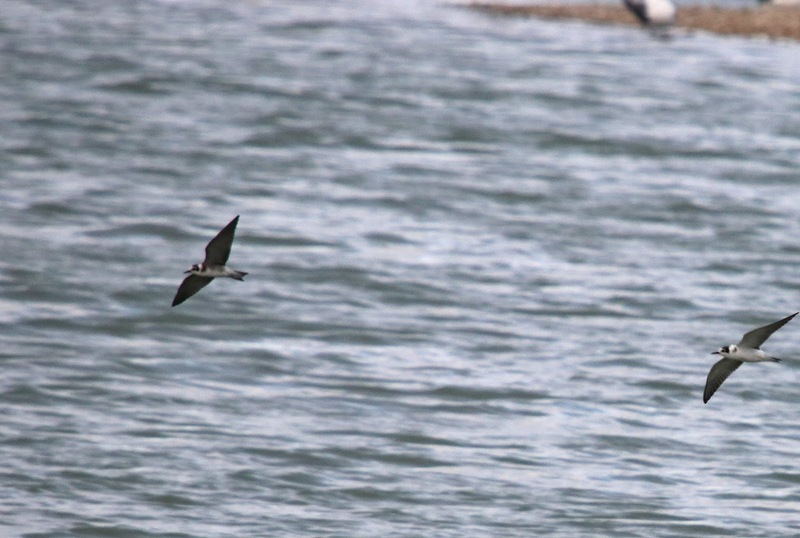 A Balearic Shearwater which flew west this evening was of note. 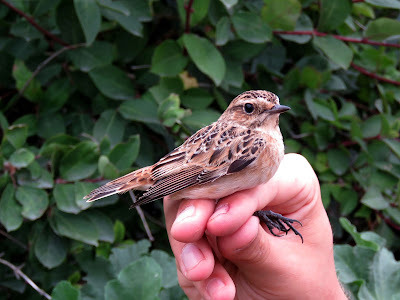 There was a small arrival of migrants on the land with Willow and Reed Warblers dominating the numbers and ten Wheatears and two Whinchats of note. 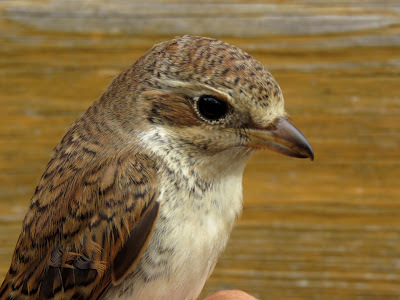 A Tree Pipit, a Grey Wagtail, a few Yellow Wagtails and 400 Sand Martins passed overhead. 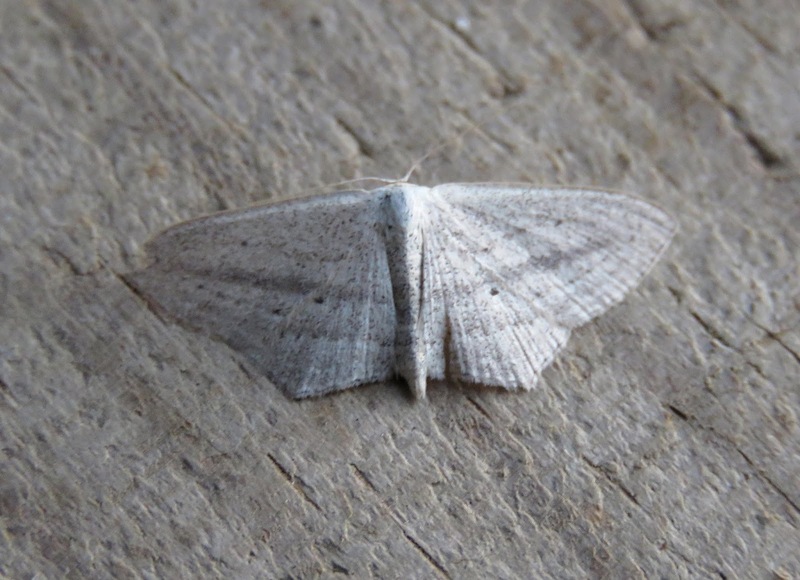 The sea was generally very quiet with three Arctic Skuas and a Black Tern lingering offshore. 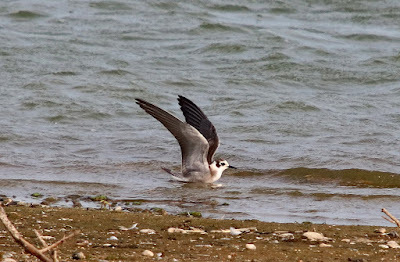 a Sabine's Gull was also reported on the Kenbirders WhatsApp group this afternoon. Further late news concerns eight Balearic Shearwaters west this evening. At least 11 Porpoises and a Grey Seal were feeding offshore. 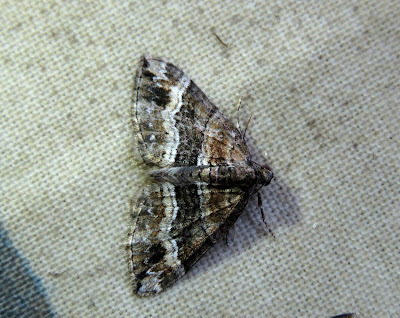 The highlights of a small catch of moths overnight were a Hummingbird Hawkmoth and our second Rosy Wave of the year. 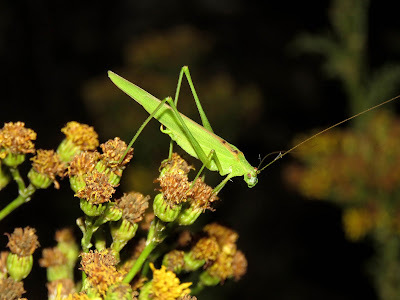 A Clouded Yellow was seen along the front of the power station. Elsewhere, the first-year American Black Tern remains on the RSPB Reserve..
After a brief movement of terns at first light the sea was generally quiet for the rest pf the day. 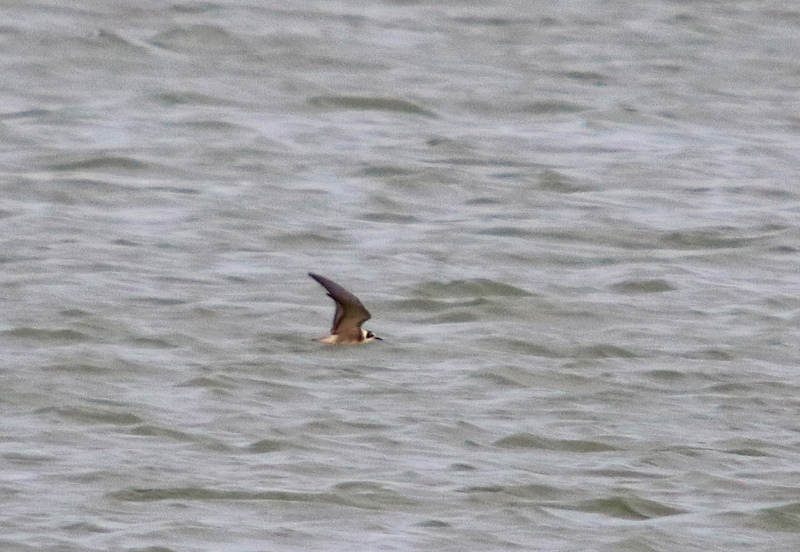 Three Arctic Skuas and five Black Terns appeared to be lingering offshore. 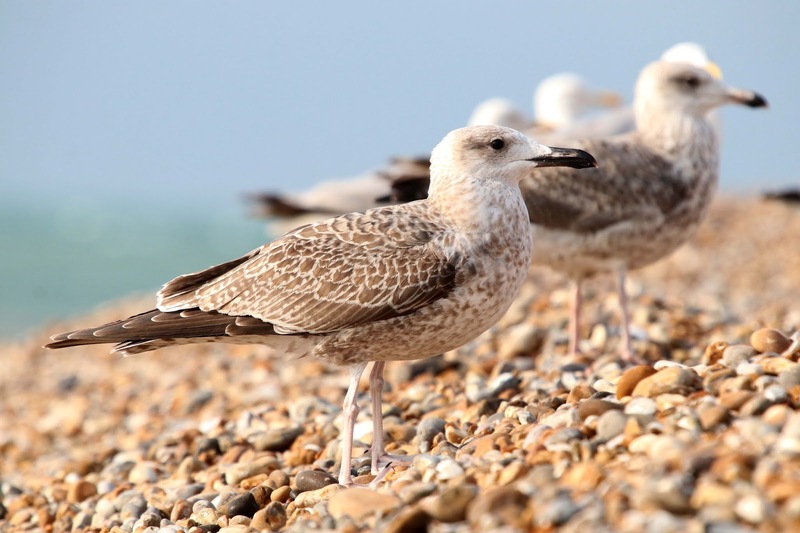 A brief offering of bread quickly brought in a few gulls which included a first-year Caspian Gull and four first-winter Yellow-legged Gulls. 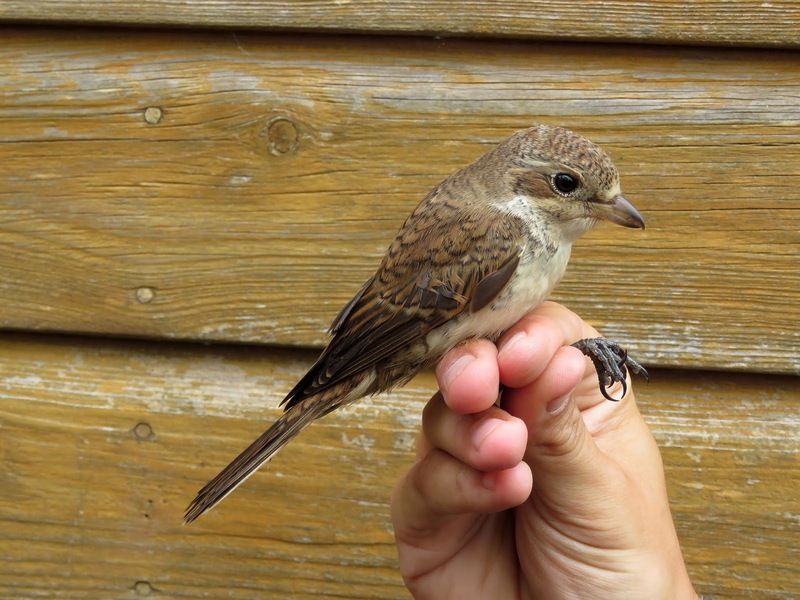 A handful of birds on the land included a Spotted Flycatcher, two Redstarts and two Whinchats whilst a Marsh Harrier flew over. 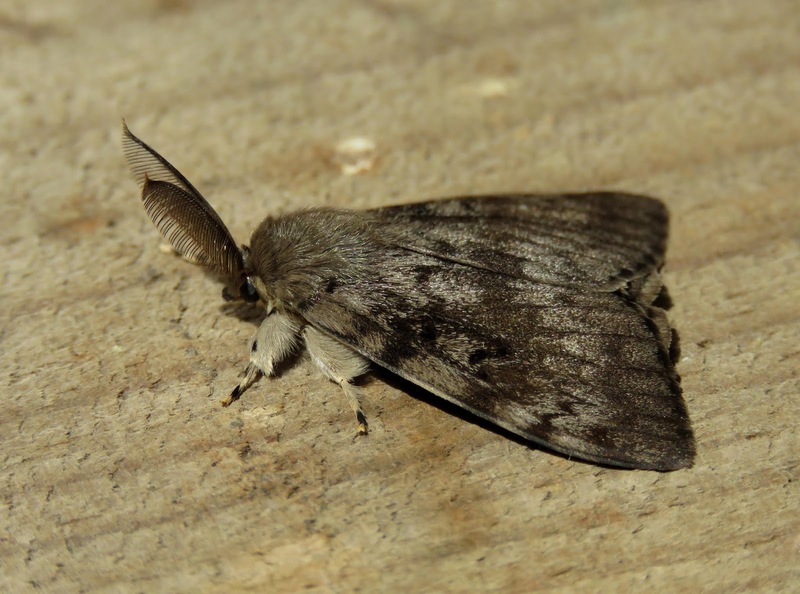 Two Brown Hares were seen on the land whilst at least 12 Porpoises and a Grey Seal were feeding offshore. A Southern Oak Bush-cricket was found inside the Observatory and a search after dark for further cricket species produced two Sickle-bearing Bush-crickets and 100's of Tree Crickets. 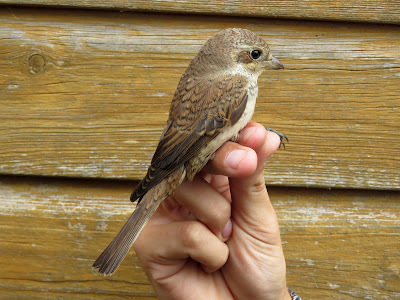 A surprisingly good morning on the land with a limited trapping effort producing six Garden Warblers and 127 Sand Martins, 17 Yellow Wagtails and two Tree Pipits overhead followed by a young Red-backed Shrike found and quickly caught in the Heligoland Trap. Seawatching was also good with seven hours of recording resulting in three Balearic Shearwaters, the first Red-throated Diver of the autumn, 12 Bar-tailed Godwits, a Great Skua, nine Arctic Skuas, 116 Kittiwakes, 1250 Sandwich Terns, 632 Common Terns and an excellent total of 70 Black Terns. Despite a fairly a cold and breezy night the moth trap was also surprisingly good with our third-ever Beautiful Marbled being the obvious highlight. 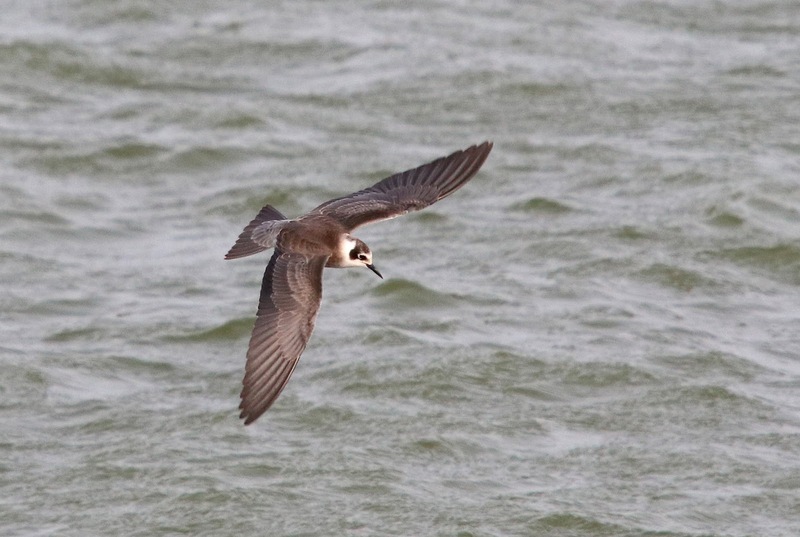 Elsewhere, the American Black Tern continues its stay on the RSPB Reserve. A breezy day which limited ringing efforts but mostly more of the same offshore with the highlight being six Balearic Shearwaters along with 990 Sandwich Terns and 1106 Common Terns. 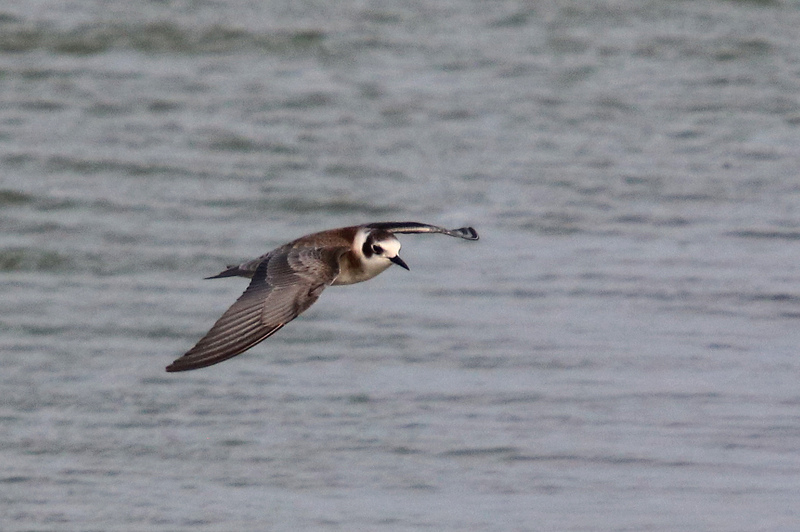 Three Arctic Skuas were also lingering. Two Buzzards flew over the area and two Redstarts were seen in the bushes. Five Porpoises were feeding offshore. 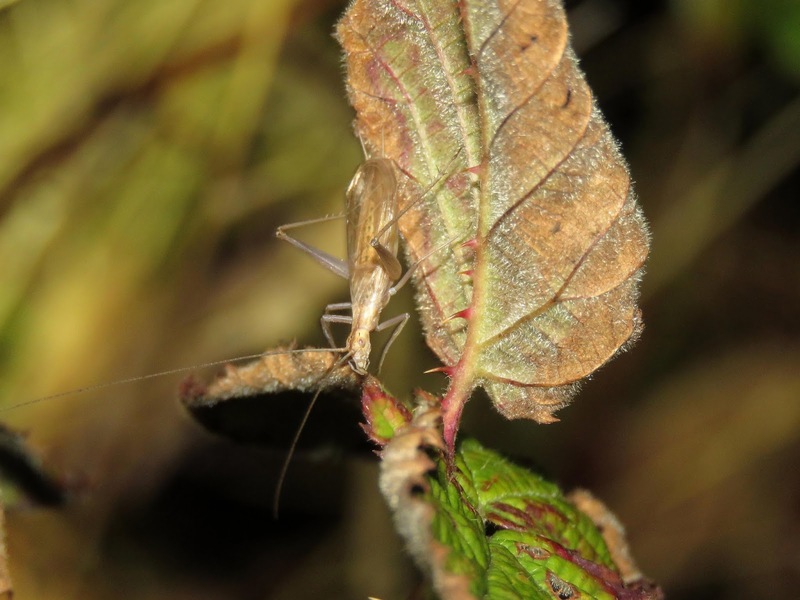 An evening session at the Long Pits with the Kent Bat Group was very interesting with five Nathusius's Pipistrelles, two Common Pipistrelles and a Daubenton's Bat being trapped. A search for unusual insects produced a few Tree Crickets but sadly no sign of any Sickle-bearing Bush-crickets, Common Groundhopper around the banks of the Long Pits and a Green Shield-bug in the trapping area. 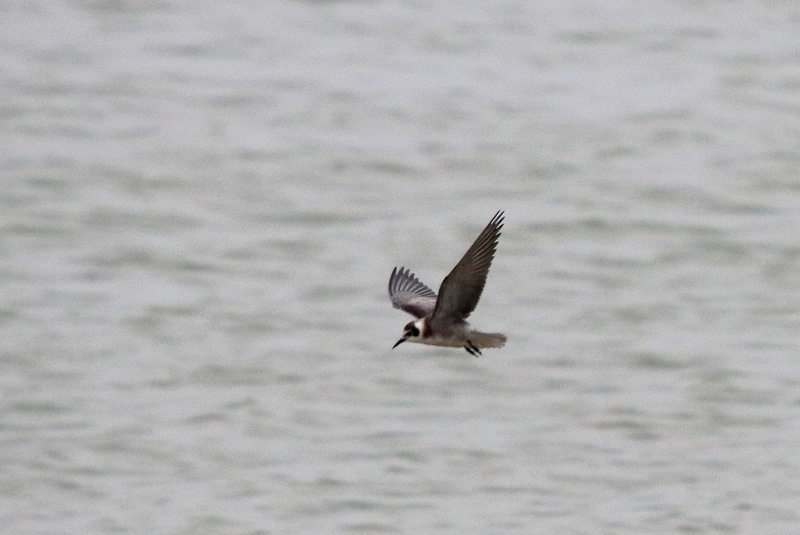 Elsewhere, the American Black Tern was still present on the RSPB Reserve and the Wryneck was still present on the Lydd Ranges but remained very elusive. 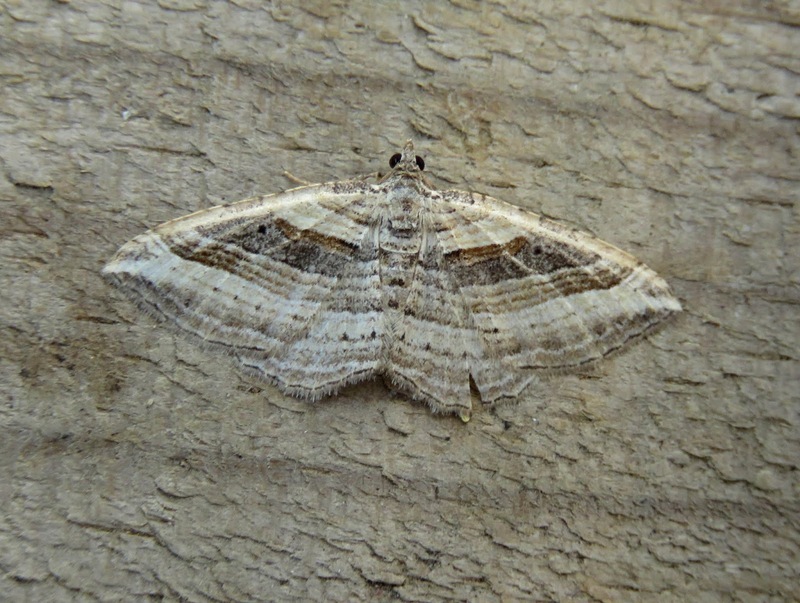 More of the same with a handful of a good variety of migrants on the land and a steady westerly passage of terns offshore. 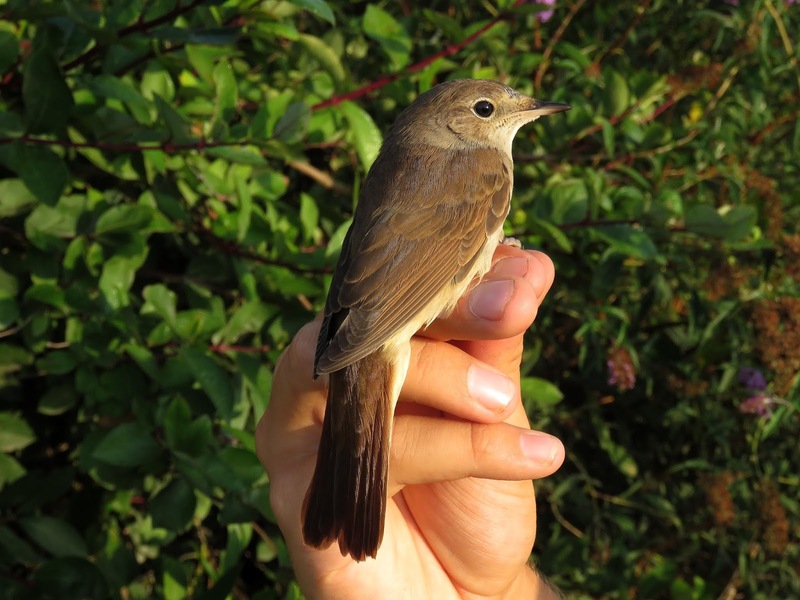 The best of the grounded migrants were a Grasshopper Warbler, a Nightingale, two Redstarts, five Whinchats and five Spotted Flycatchers. 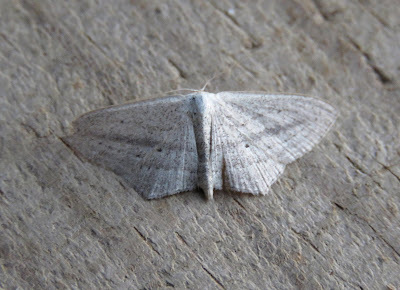 Seawatching produced a Balearic Shearwater, three lingering Arctic Skuas and over 600 each of Sandwich and Common Terns. 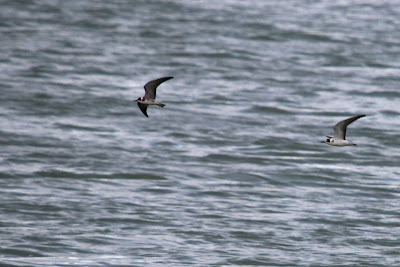 Five Porpoises and singles of Grey and Common Seal were feeding offshore. 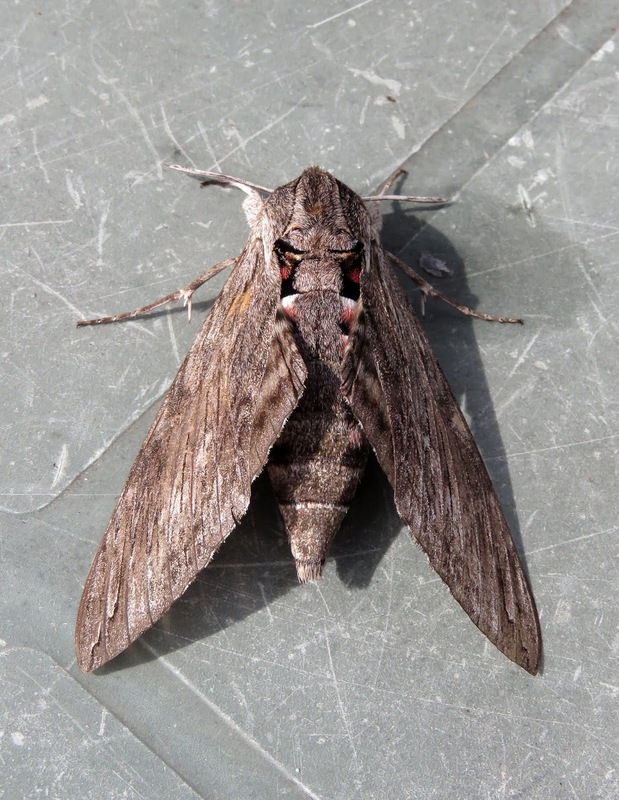 Another Convolvulus Hawk-moth was caught overnight. Elsewhere, the first-winter American Black Tern was still on Burrowes Pit on the RSPB Reserve where it was seen up until dusk. 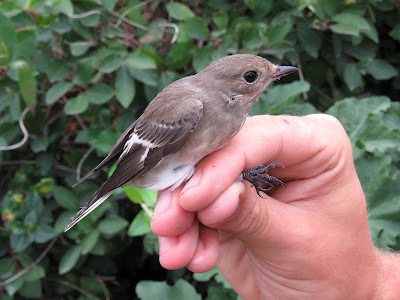 Migrants continue to pass through on the land in small numbers with three Pied Flycatchers, two Spotted Flycatchers and two Redstarts along with 40 Willow Warblers. 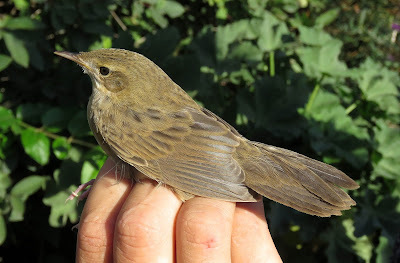 A Tree Pipit and 12 Yellow Wagtails flew overhead. 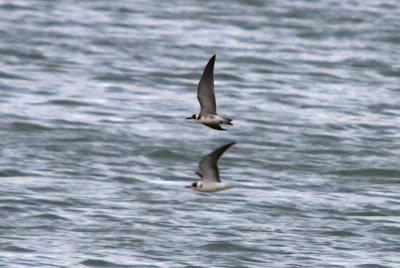 More of the same offshore as well with Sandwich Terns (1413) and Common Terns (1468) moving west in 5.5hours of watching along with four Black Terns, eight Arctic Terns and five Little Terns. 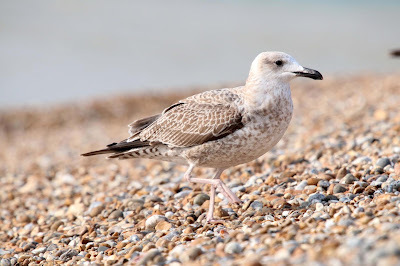 At least four Arctic Skuas were lingering off the Point and two first-winter Yellow-legged Gulls were coming to the offerings of bread at the fishing boats. Three Porpoises and a Grey Seal were also feeding offshore. The best of the nights moth trapping was a Convolvulus Hawk-moth.. Meanwhile, on the RSPB Reserve the first-winter American Black Tern continues its stay. For most of the day it was again fairly distant (for photography at least) but it finally came in close and landed in front of the hides for a few minutes this afternoon and in good light allowing some better images to be taken. A Wryneck was also seen at Galloways. It has now been there for six days but it is very elusive and access is impossible at times. 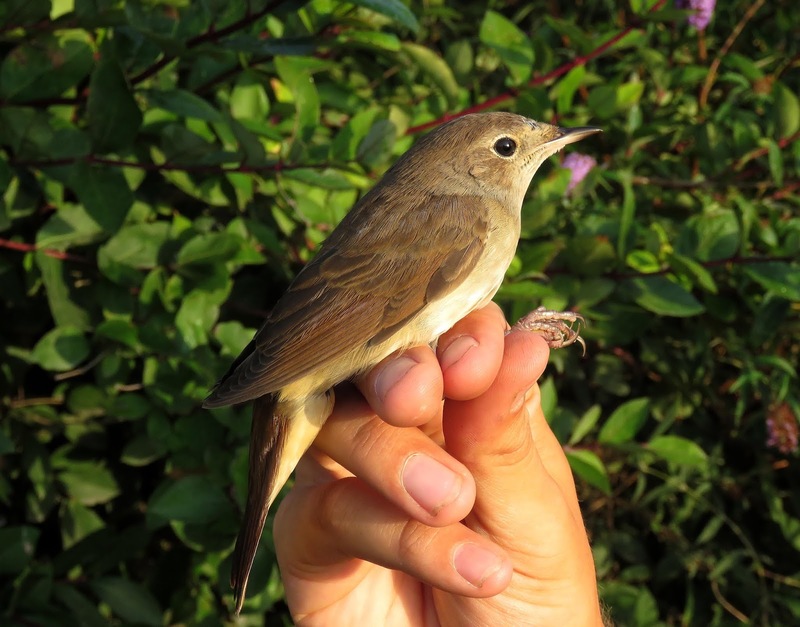 A nice little arrival of migrants in cloudy conditions this morning with 60 Willow Warblers providing the numbers and a few scarcer migrants including a Greenshank, a Hobby, 10 Lesser Whitethroats, two Garden Warblers, nine Spotted Flycatchers, a Nightingale, two Redstarts, three Whinchats and 11 Wheatears. 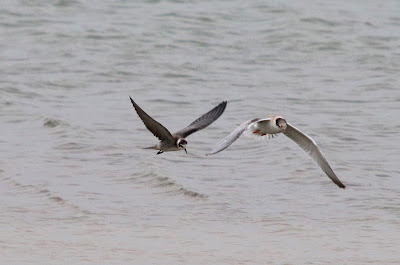 The westerly movement of terns at sea continues with 1284 Sandwich Terns, 1290 Common Terns, five Arctic Terns, three Little Terns and eight Black Terns and with around 15 Arctic Skuas harassing them. 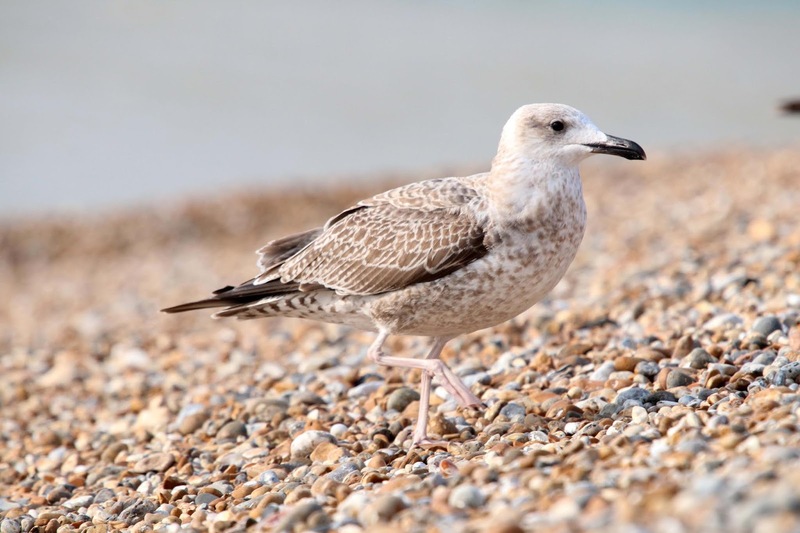 A first-winter Yellow-legged Gull was also seen at the fishing boats..
A Clouded Yellow butterfly was seen but the moth trap was very poor. 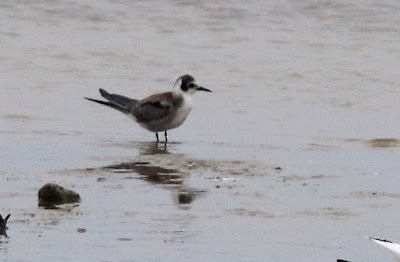 Elsewhere, the first-winter American Black Tern remained on Burrowes Pit, RSPB Reserve all day although views for much of the time were fairly distant. Numbers of common migrants remain low but the variety was quite high today with a Pied Flycatcher, three Whinchats, two Redstarts and two Spotted Flycatchers in the bushes of note. 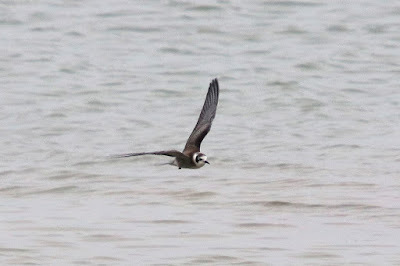 Offshore, there were at least five Arctic Skuas and lots of terns including at least 24 Black Terns, 1300 Sandwich Terns, 550 Common Tern and eight Arctic Terns. 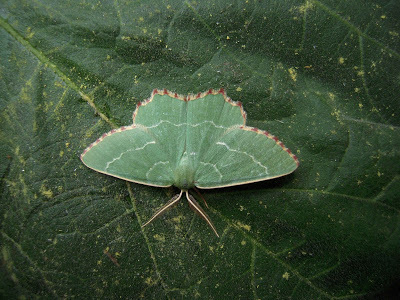 A Clouded Yellow was seen in front of the power station and three Hummingbird Hawkmoths were seen around the Point. A very tatty Rosy Wave was trapped overnight - only the 13th record for the Observatory. 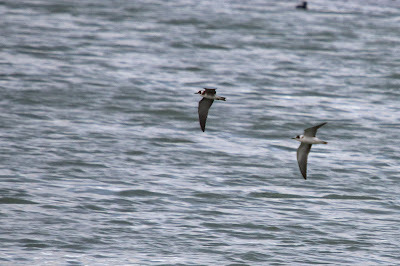 Three Porpoises and a Common Seal were seen. 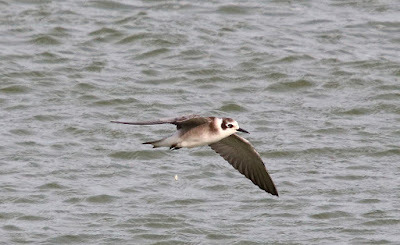 The star bird though was found late in the day on Burrowes/RSPB Reserve by Stephen Message when he discovered a juvenile/first-winter American Black Tern among the large numbers of terns feeding there. Left hand bird in top three images and top bird in fourth image. 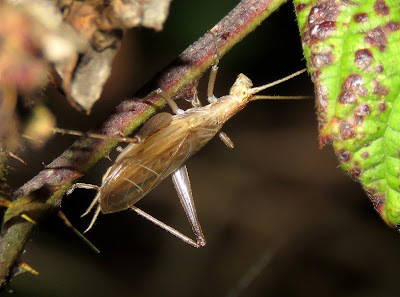 until shortly before dark so will hopefully still be there tomorrow. More of the same on the land with just a scattering of commoner migrants about including 20 Willow Warblers, two Sedge Warblers and a Garden Warbler. A male Marsh Harrier, two Tree Pipits and 20 Yellow Wagtails passed overhead. 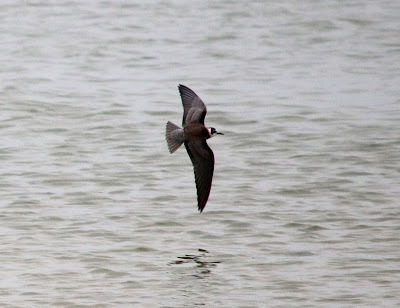 Offshore, the almost constant westerly passage of terns in recent days continued with five hours of observations producing an excellent 2265 Sandwich Terns, 336 Common Terns, four Arctic Terns, two Little Terns and seven Black Terns. Three Great Skuas and a few Arctic Skuas were also seen and an additional three Black Terns were feeding at the Patch. 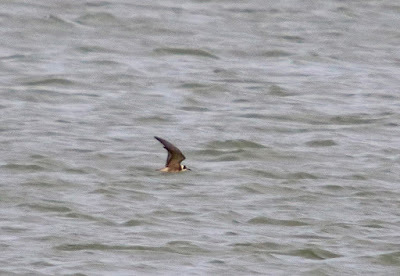 In breezy conditions most of the interest was offshore where there was a steady stream of Sandwich and Common Terns passing west all day and also two Balearic Shearwaters, two Great Skuas and eight Black Terns through. 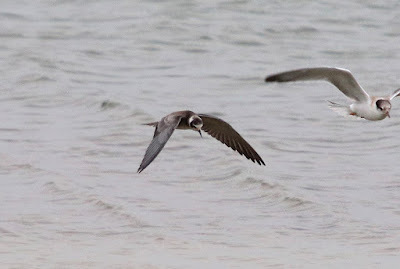 Arctic Skuas were loitering with intent throughout the day. 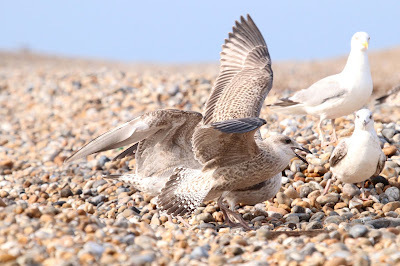 The juvenile Caspian Gull (or a hybrid) and a first-year Yellow-legged Gull were among the gulls at the fishing boats and a Little Ringed Plover also made a brief stop there. 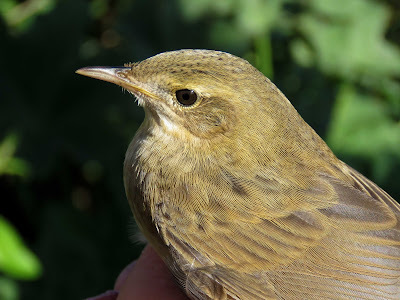 It was fairly quiet on the land with just a few Willow Warblers and a Tree Pipit to be seen. There was another small arrival of migrants this morning with 20 Willow Warblers dominating the numbers. 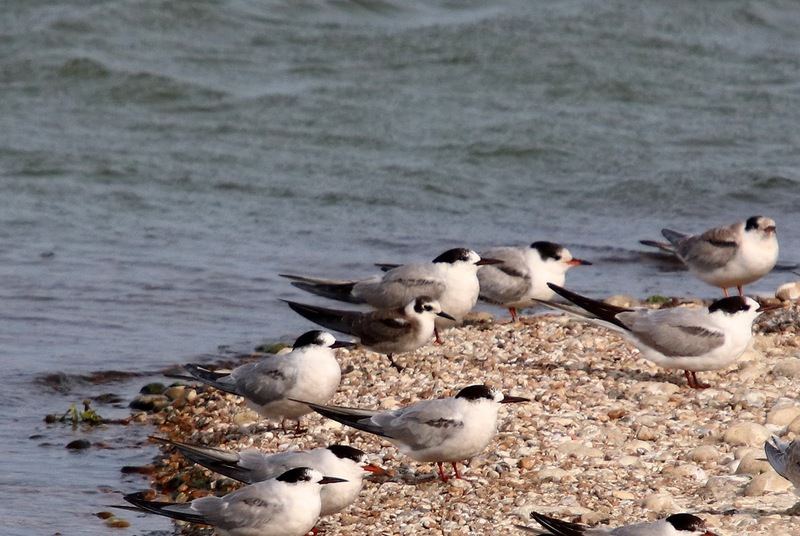 Seawatching provided most of the interest for the rest of the day with a long afternoon watch producing two Grey Plovers, 660 Sandwich Terns, 150 Common Terns and nine Black Terns. 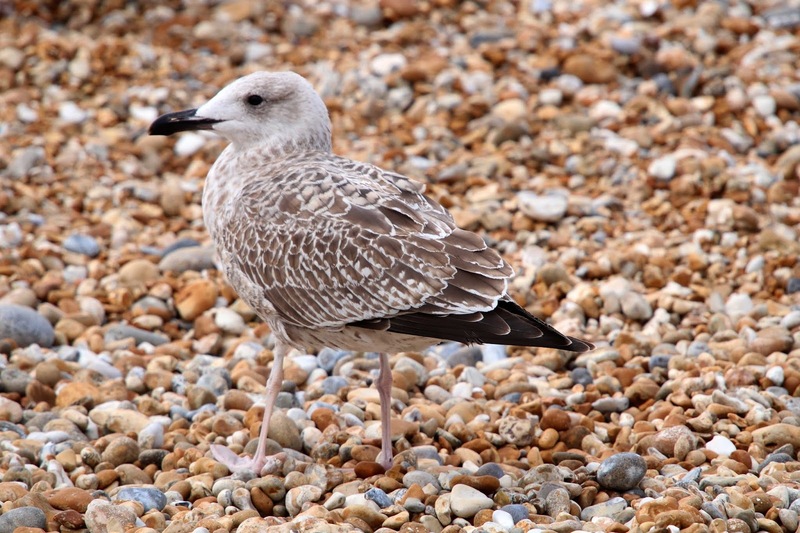 Three lingering Arctic Skuas and a juvenile Yellow-legged Gull were also present. Six Porpoise, a Common Seal and two Grey Seals were feeding offshore. 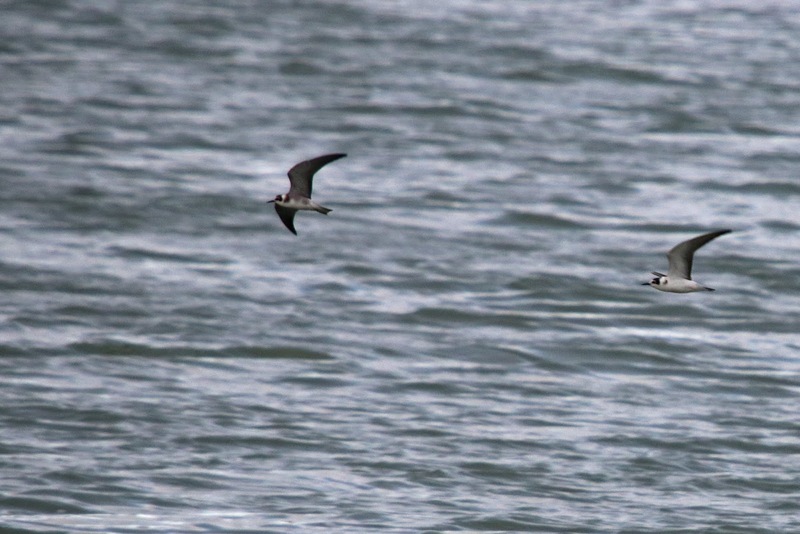 The highlight of the day was an Osprey which few out to sea in the afternoon. 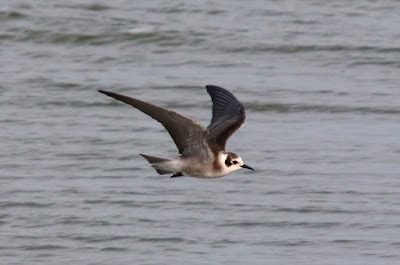 Four Black Terns flew west during the morning seawatch and a flock of nine Whimbrel flew over the area.. There was a small arrival of migrants on the land with 25 Willow Warblers, three Garden Warblers, 20 Lesser Whitethroats, ten Wheatears and two Tree Pipits being the most significant. Five Porpoises and a Common Seal were feeding offshore. 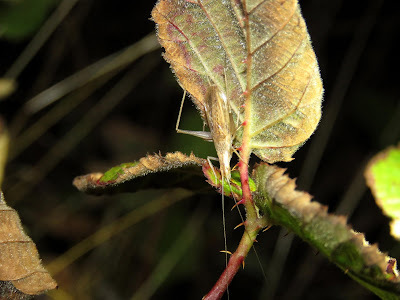 A Clouded Yellow was seen. 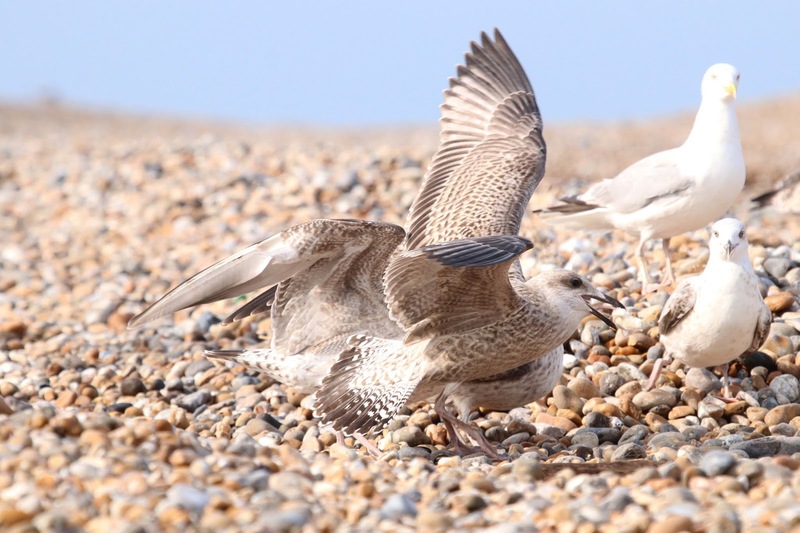 A check of the gulls feeding and roosting at the Patch this morning proved quite profitable with the finding of a juvenile Caspian Gull (or hybrid). 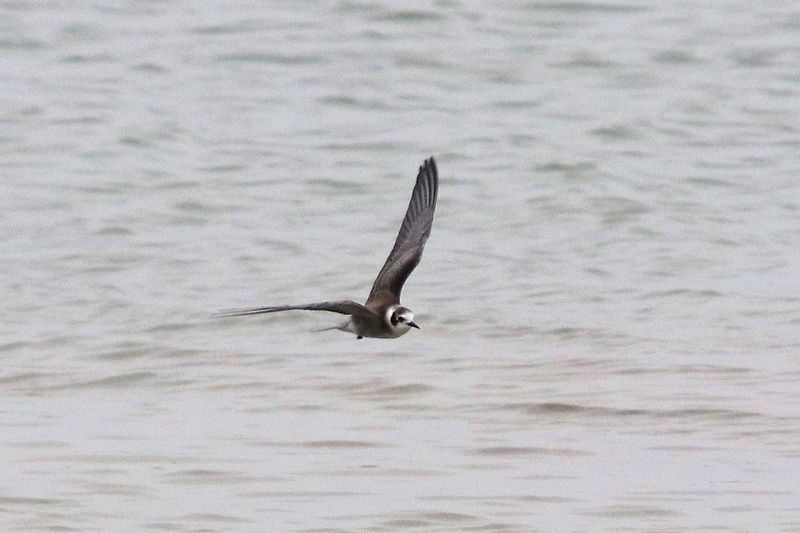 A Black Tern was also present. 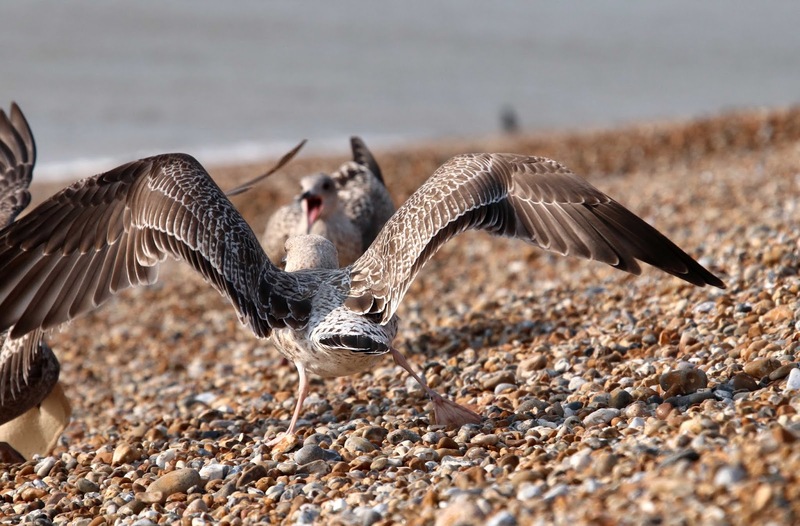 In the afternoon there were four Arctic Skuas and two juvenile Yellow-legged Gulls loitering at the fishing boats. There was a steady westerly movement of terns with 498 Sandwich and 635 Commons during three hours of watching. 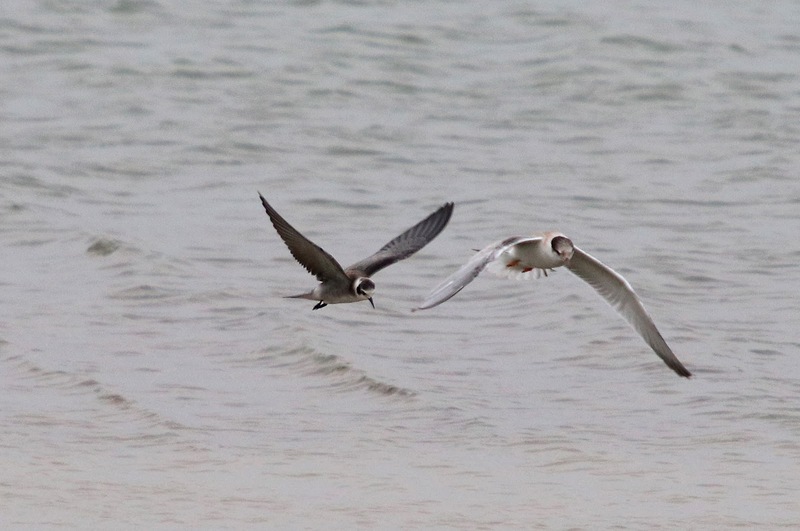 Two Porpoises and a Common Seal were feeding offshore. 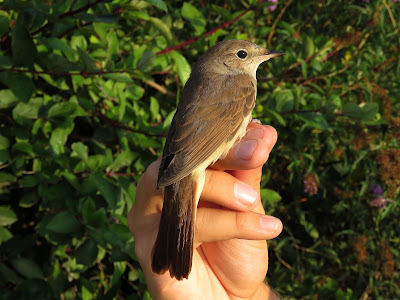 There was a small arrival of migrants this morning, mostly centred around the moat, with 40 Willow Warblers and a Spotted Flycatcher of note while two Tree Pipits and 15 Yellow Wagtails passed overhead. 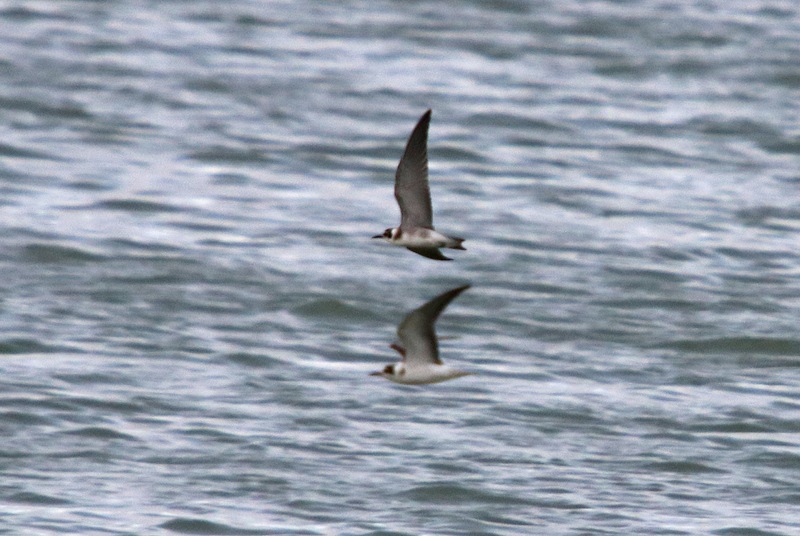 Offshore, there was a big westerly movement of Sandwich Terns with over 1700 counted along with six Arctic Skuas. 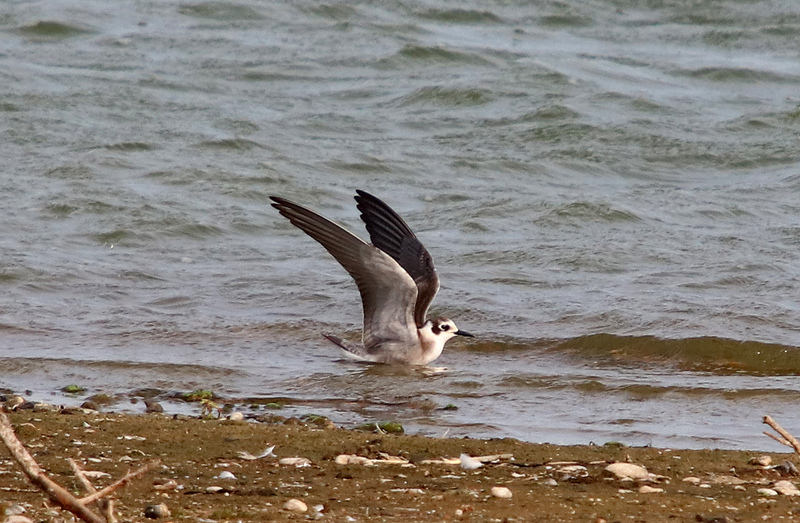 A Black Tern was feeding at the Patch and four Yellow-legged Gulls came to the bread offerings at the fishing boats. Not a great deal to report today. 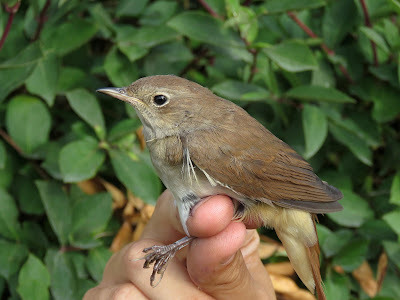 A few migrants, mainly around the Long Pits again, were present including 20 Willow Warblers and 11 Lesser Whitethroats. Fifteen Yellow Wagtails and a Grey Wagtail flew over. Three juvenile Yellow-legged Gulls were seen at the fishing boats. 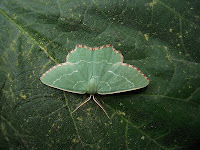 A Clouded Yellow and a Holly Blue were of note among the butterflies and a V-Pug was the only notable moth trapped overnight. 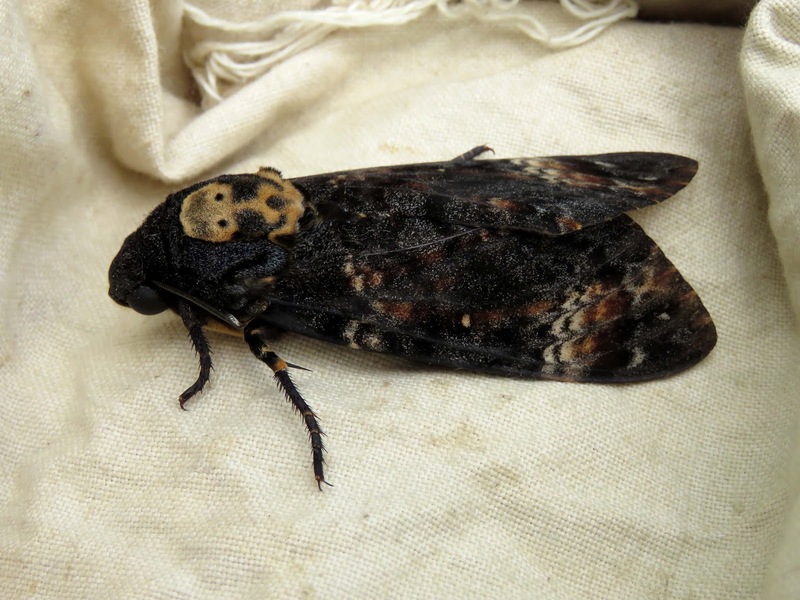 A stunning Death's Head Hawkmoth was found at Lydd-on-Sea and was brought to the Observatory for public viewing. Frequent heavy downpours throughout the day hampered observations but there was clearly very little to be seen in the bushes and several hours of seawatching produced just seven Manx Shearwaters of interest. Single Common and Grey Seals were feeding offshore. The moth traps produced another decent record for the area with only our fifth-ever Barred Rivulet. A breezy day which eventually produced a Balearic and two Manx Shearwaters, two Arctic Skuas and a Great Skua of note along with large numbers of Gannets and Sandwich Terns. 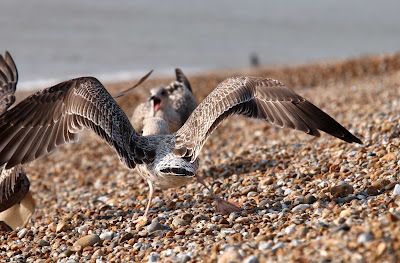 A Yellow-legged Gull was also seen. 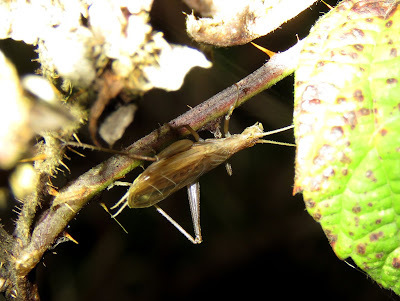 It was very quiet on the land. 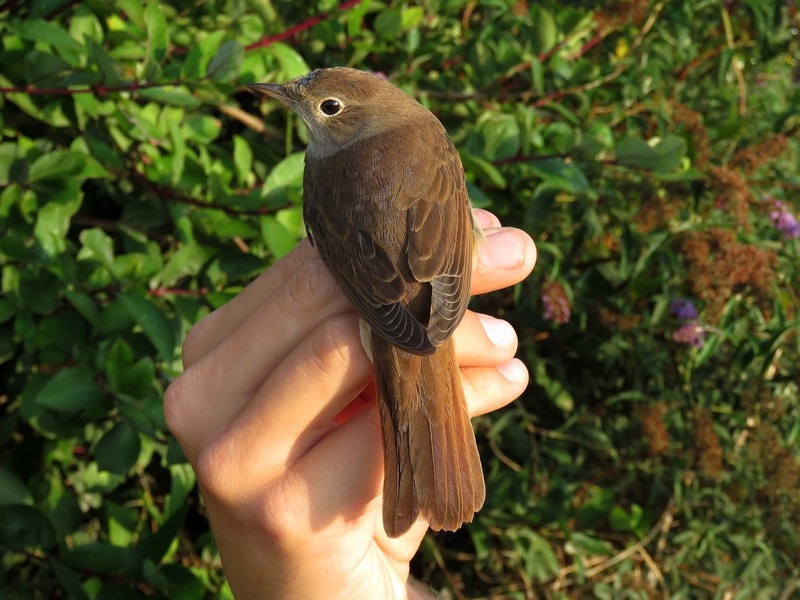 There was a large arrival of migrants this morning but unfortunately for ringing purposes it was almost all around the Long Pits. 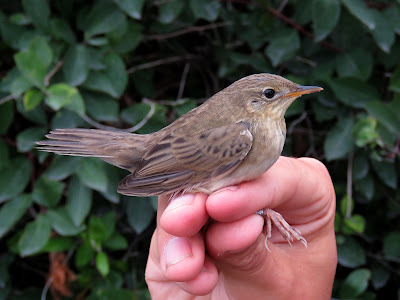 The highlights were a Grasshopper Warbler near the Pumphouse and a Spotted Flycatcher at the top end while numbers were provided by 100 Willow Warblers, six Sedge Warblers, 25 Reed Warblers, four Garden Warblers and 120 Whitethroats. The sea was very quiet with just a lingering juvenile Yellow-legged Gull of note.